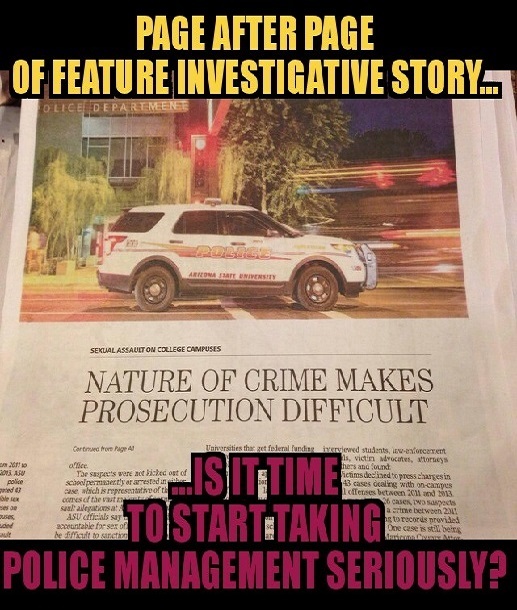 Anne Ryman and Rob O’Dell, investigative reporters from the Arizona Republic, have been digging into our assertions that Arizona State University’s Police Department is understaffed, due in part to low departmental morale (which negatively effects employee retention). Arizona State University’s Police Department struggled to schedule a full complement of patrol officers, failing to meet its own requirements a majority of the days during the spring semester, The Arizona Republic found. Six out of seven days during the semester, at least one shift did not have all seven officers scheduled, as ASU police requires to patrol Tempe and three other satellite campuses. As a result, supervisors had to either pay overtime, reassign someone from another job or leave positions on a shift vacant. The department can’t say how often it left a post empty on any given patrol shift. Public records, the police chief’s advisory-board documents and interviews with more than a dozen current and former employees paint a picture of an agency that is understaffed for patrol shifts. It’s not clear whether the staffing shortage affects crime rates. But records and interviews show the department sometimes needs to pull officers from performing other duties, such as criminal investigations and proactive police work like crime prevention, to work patrol shifts. Former officers have expressed concern about their safety and the safety of students in a report to the police chief and questioned whether the department had the staffing and training to properly respond to a shooter on campus. Campus police staffing levels have not kept up with ASU’s enrollment. ASU’s ratio of sworn officers to students is about25 percent below the national average for large, public schools, a national report found. ASU officials acknowledge there have been staffing challenges but have been hiring to bolster department resources. The police budget was increased for the budget year that began July 1 with a half-dozen new officers hired since then. ASU police officials recently signaled how important it is to have a more visible police presence when they announced they were beefing up patrols following a sexual assault on campus Sept. 9. Morgan Olsen, ASU’s executive vice president and chief financial officer, said the university places a priority on having safe and secure campuses, and to his knowledge, public safety hasn’t suffered with the staffing. Some police agencies reduced staffing during the recession, but ASU didn’t eliminate police officers or aides, he said, even as the university’s state funding was cut 40 percent and ASU eliminated 2,055 jobs in other areas. “Generally, we’ve been able to maintain coverage and maintain responsiveness,” Olsen said. ASU President Michael Crow, who has often touted the safety of the campuses, said through a spokesman that Olsen was the appropriate ASU official to speak about police staffing. In June, Police Chief John Pickens, who had led the department for 14 years, announced that he was transferring to a newly created job in charge of university security initiatives. An ASU student-safety task force is recommending the Arizona Board of Regents, which oversees the state universities, conduct an independent review of the safety needs at all three state universities. The task force was formed in response to a series of articles in The Republic last September about alcohol-related crimes. The regents will hear safety recommendations at a meeting this week in Flagstaff. But one former employee is clear what he believes the university should do: increase staffing. ASU is the largest public university in the country with 82,000 students, including 13,000 online-only students. The Tempe campus alone covers more than 700 acres with 57,800 students. A typical patrol shift has seven sworn officers, including a sergeant, to watch over ASU’s four Valley campuses: Tempe, West, Polytechnic and downtown Phoenix. But on six of every seven days in the spring semester, ASU was unable to schedule the full seven staff officers for at least one of the three daily patrol shifts. The shortage could have been caused by a variety of factors, including officers out sick, on vacation, injured, on family-medical leave or at court. On more than half of the 151 days examined by The Republic, at least two of the three daily patrol shifts were scheduled to be short staffed. All three shifts were consistently scheduled to be short of staff, The Republic found, with the swing shift beginning in late afternoon the most underscheduled. ASU police and administrators contend that not every shift had vacancies because they used overtime pay or pulled someone from another job to cover the open position. The university could not say which shifts they were able to cover, saying it would take them weeks to determine if officers actually worked those shifts. Staffing levels sometimes dipped so low the Tempe campus would have only two officers on staff, according to a report given last year to the police chief based on interviews with police officers and aides. The university can call surrounding city ­police agencies for backup when help is needed. But officers from another agency are sometimes unfamiliar with the campuses, so it takes them longer to arrive. Olsen acknowledged that last fall, an unusually high number of people were on family-medical leave for injuries or as new parents, he said. Others had to work more overtime as a result. The department had 74 full-time officers at the end of the fiscal year. Department officials say they’ve hired six since July and say they plan to hire nine more, which would bring the total to 89 sworn officers and supervisors. ASU has about 1.1 sworn officers for every 1,000 students, below the national ratio of 1.5 for large, public schools, and below the University of Arizona’s 1.6. A 2005 survey by the U.S. Department of Justice found larger public schools with more than 15,000 students had 1.5 sworn officers per 1,000 students. Filling all the budgeted slots would bring ASU up to 1.3. ASU’s five-member investigative unit has one less person than UA’s, which has 40,000 fewer students and fewer violent crimes. When 42 police aides are factored in, ASU officials said, the per-student ratio of police to students is higher. The aides help patrol, respond to emergency calls such as minor traffic accidents and take reports on minor thefts. The mostly full-time aides are not required to go through the police academy, they don’t make arrests and they don’t carry guns. The department plans to hire 20 more police aides this year. But David Perry, president of the International Association of Campus Law Enforcement Administrators, said it’s not appropriate to include police aides in the per-student ratios because aides cannot perform all the functions of a sworn officer. Campus law-enforcement experts say there is no universally accepted method of determining staffing and no “magic” number of officers per student, though enrollment is a key factor. More students means more calls for service, Perry said. Campus police in some other areas of the country also are grappling with determining the appropriate number of staff. Last year, Capt. Eric Chin of the Purdue University Police Department surveyed schools in the Big Ten Conference. He found the highest ratio at the private Northwestern University at 2.9 per 1,000 students. Ohio State was the lowest with 0.85 officers per 1,000. Olsen said ASU uses a more complex calculation than enrollment to determine staffing, including crime trends and the department’s ability to cover the campuses. He said he wouldn’t necessarily characterize the department as being understaffed. “If you were to go out and ask a particular department in the university, maybe the biology department or the folks who maintain the grounds, ‘Are you understaffed? Could you do more with more people?’ Well, sure, we could do more good things with more people. So that’s not necessarily surprising,” he said. Whether the staffing shortages affect crime rates is inconclusive. Crime statistics reported to the federal government under the Clery Act show a mixed picture of ASU’s Tempe campus. The Republic compared ASU with its 15 peer universities along with University of Arizona and Northern Arizona University from 2008 to 2012, the latest data available. Rates of forcible sexual offenses and robbery have risen at ASU’s Tempe campus, while burglary and aggravated assault rates have fallen or remained the same. ASU’s rates of sexual offenses are lower than most of its peer schools. It has a higher rate of robbery and a much higher rate of aggravated assaults when compared with its peers. The Republic filed public-records requests July 29 with ASU for police response times and clearance rates for crimes, but the department has not provided the information. Tahmahkera, the ASU retired sergeant, calls ASU a “big shopping mall for thieves” because of the open nature. A student gets up to get a drink of water and leaves his laptop on a table. He returns to find it gone, including his paper due for class. The Tempe campus reported 963 thefts and another 98 burglaries, the category that includes bike thefts, in 2012, the most recent year annual statistics are reported to the federal government. Violent crimes are rare. The Tempe campus reported 16 sexual offenses in 2012. Ten robberies and 10 aggravated assaults occurred on campus that same year. A larger police force is something the university has planned for several years, ASU’s Olsen said. But like a lot of other things, it didn’t get funded during the recession. The university would like to have more officers at the downtown Phoenix campus as well as multiple officers on the West and Polytechnic campuses, he said. Blogs and public comments show conflict within the campus police department. An anonymous blog called “The Integrity Report” published complaints about working conditions and a supposed clique that runs the department. Then, the video of an ASU officer arresting an African-American professor in May went viral. Civil-rights groups were outraged. An FBI investigation is ongoing into whether the professor’s rights were violated. ASU declined to make a representative of the Police Department available to speak on the record for this story. But public records show discord within the department. The minutes offer recommendations such as boosting pay and significantly increasing staffing. ASU officials say many changes have already been made. ASU hired a police recruiter earlier this year and raised pay for experienced officers. Retention pay was added to encourage officers to stay. A new police chief is expected to be named soon. Olsen said the university is trying to do everything possible to foster a good environment, where high-quality people want to work. The Arizona Republic filed public requests for staffing schedules, police patrols, budgets, meeting minutes and other information related to police staffing from the Arizona State University Police Department, beginning in May. 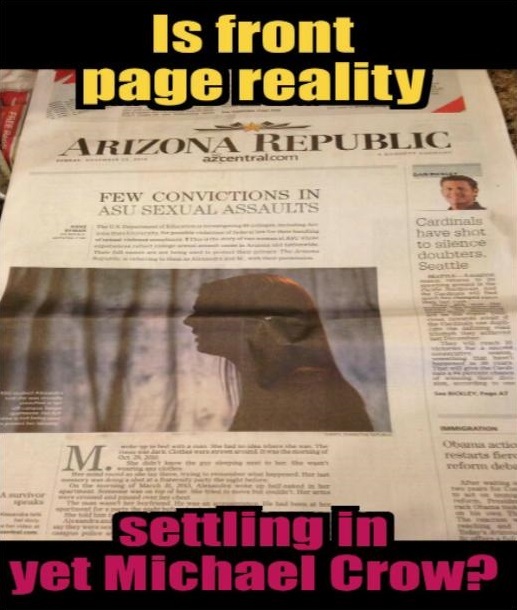 The newspaper compared ASU staffing figures with national studies and data provided by other universities. One of the documents The Republic received was a breakdown of staffing for the spring semester 2014, which shows how many sworn officers were scheduled to work each of the three patrol shifts and the department-required staffing for that shift. The Republic analyzed the staffing on each of the three patrol shifts and determined that in six out of every seven days, ASU police had at least one shift with a scheduled staff shortage. 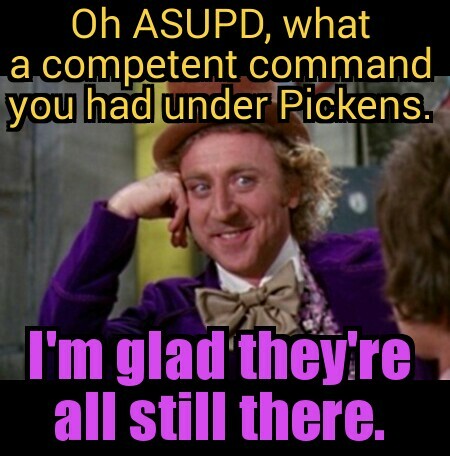 Morgan Olsen makes excuses for ASUPD’s problems: Dismissing the obivious staffing shortage by claiming that every department at ASUPD could use more staffing is ludicrous. Unlike the two departments Olsen cited–biology and grounds–their staffing levels do not have any impact on the crime rate or safety of the campus. A university CAN function with an understaffed or non-existent biology or grounds department; it can NOT function with an understaffed or non-existent police department. Olsen said “the university is trying to do everything possible to foster a good environment, where high-quality people want to work”: That would mean that the university’s Human Resources department would work with employees who have expressed their concerns with the work environment at ASUPD. Instead, ASU’s HR, Kevin Salcido, has disregarded any employee concerns regarding ASUPD that have been brought to his attention. Salcido has repeatedly refused to intervene in the department’s issues. ASU claims the university has a higher police to student ratio than the numbers the Arizona Republic reported…because ASU included its unarmed, civilian police aides. Police aides are an effective tool, but they are merely support the role of sworn officers; police aides can not make arrests, and they can’t respond to serious calls for service. People are paying attention to the situation at ASUPD: Between this article, The Integrity Report, and the viral news article about the arrest of Professor Ore, the university’s problems have become increasingly exposed in a way that hasn’t previously happened. No amount of PR or minimization of the issues can hide ASUPD’s problems now. The only true solution to saving the department is to remove problem employees, and restructure the department from the top down. 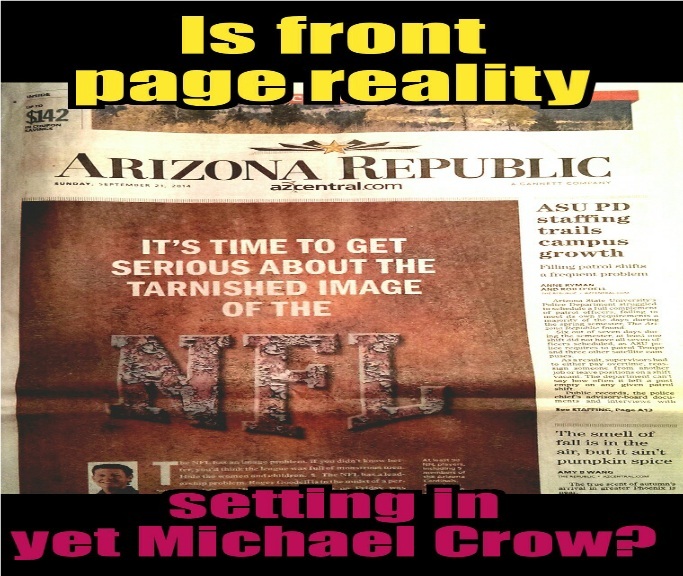 Edited to add: We covered the situation with the Chief’s Advisory Board in December 2013. To read the full contents of the meeting minutes, click here. Este artigo é um resumo da experiência de uma pesquisa de videos na net (especialmente no youtube) com as palavras compartilhar, partilhar ou compartir mais (e ainda) “música, animação, tudo, etc”. Esta práctica de usar a “partilha” como eixo central da mensagem que se quer mostrar, faz que os productos audiovisuais tenham uma pressão adicional para que tenham uma alta qualidade de edição, porque a palavra “partilha” tem uma grande conexão com uma energia que todos levamos bem dentro. A “Partilha” tem uma alta qualidade conceptual em si mesma. Por exemplo, encontramos uma alta carga de significado tanto ao ver videos para crianças, como videos para adultos . Também encontramos videos que mostram uma visão de partilhar como algo mais integrado na nossa cotidianidade e sem essa polarização de criança – adulto, mas todos eles mantêm a grandeza do significado do “partilhar“. Por exemplo, e como caso bastante fora de tópico neste artigo, esta é uma fotomontagem (download nao partilhado) de um convite a “compartir una ciudad” através de fotos. Com a palavra “partilha” torna-se mais visível a polaridade cultural histórica de associar um tipo de “partilha imaterial” para adultos para ser mais sábio (neste caso com interpretações menos religiosas, coincidindo com resultados de obras audiovisuais feitas por portugueses) e outro tipo de “partilha material” para ensinar crianças a serem eficientes. Dentro deste contexto vemos novas gerações de audiovisuais sem complexos desta polaridade, como no caso do video da casa fora do eixo, mencionada anteriormente. Podemos observar outro exemplo interessante, inclusivo e “atual” numa banda de Guimarães (Portugal) que decidou chamar-se Projeto Partilha, Canção Escolhas. Já existe um filme (trailer) que se chama “a partilha” e tem como guião a partilha de uma herencia entre irmãs que estão a morar na casa que devem vender. Quando procuramos “Compartir“, aparecem mais vídeos sugestivos, e muitos mais ainda relacionados com a infância. Há mais videos pedagógicos com bastante vontade de ordem social. Este (e outro similar) e este (muito bom) também são mais uma fotomontagem do mesmo género. Ou este parecido, mas este já mostra “quiero compartir contigo (amarte a tí)“. De outra forma começam a ver-se vídeos mais amadores de músicas de rap ou de intervenção, tentado mostrar com recursos humildes o conceito da partilha de um modo já bastante naturalizado. O conceito da partilha interessa principalmente a empresas da conectividade sejan de telecomunicaçoes em geral tipo Movistar (“Compartida la vida es mas“), Claro (“Compartilhar“), Tmobile (“life is for sharing“) ou incluso Mastercard (“compartir porque si, no tiene precio“). Temos casos de actualidade interesante como estas apresentaçoes de projectos por començar. Este é ambicioso pero difuso (“o medo de partilhar tudo“), este mais elaborado y claro (“compartilhando paixoes“). Documentario de uma ruta em bicicleta por la protecçao das sementes criolhas (“projecto compartilha ciclovida“), ou uma apresentaçao dum “altercambio, compartir es bueno“. O conceito de: “partilha coisas que sejan significativas e utiles para as pessoas, alem de datos da tua vida com os teus amigos” pode-se ver em videos tambem bem elaborados que como este tenta-nos mostrar o contexto da palavra “crowdlearning” donde numa entrevista com mais profundidade a uma das fundadoras nombra-se a “partilha de informaçoes, de ideais, incluso de dinero“. Compartiresvivir.org tenhe um video explicativo moito bom e uma escola marista fiz esta música e fotomontagem interesante. As redes de partilha integral, tipo redes de apoio mutuo, cooperativismo colectivista ou relacionados nao redifican-se tanto a través da internet, nem senten de usar o conceito de partilha como eixo central da sua mensagem. Estas redes sao inciativas mais presenciais para já, por isso nao producen moito video se calhar. A um nivel global, a “partilha” trata-se moito a volta das creaçoes digitais. Por exemplo, em videos promocianais a volta de “sharing ideas“. Ou em apresentaçoes de projectos ja a funcionar para partilhar obras digitais com as creative commons, onde falan de definir uma “shared culture” ou na cultura livre. Podes (eu vou a continuar a procurar videos mais específicos onde se mostre o “partilhar” como o seu mensagem central em material audiovisual. Se queres seguir a procura, recomendo visitares a categoria de audiovideos da wiki ou contacta conmigo, e vamos lá partilhar mais alguma coisa.